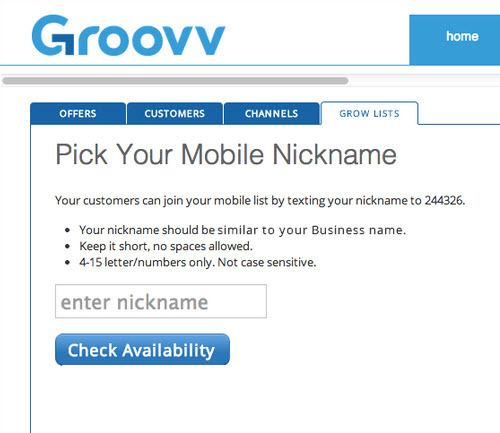 A Text2Join nickname is a unique keyword that your customers text to Groovv Offers’ short code 244326 to join your Mobile Customers list. 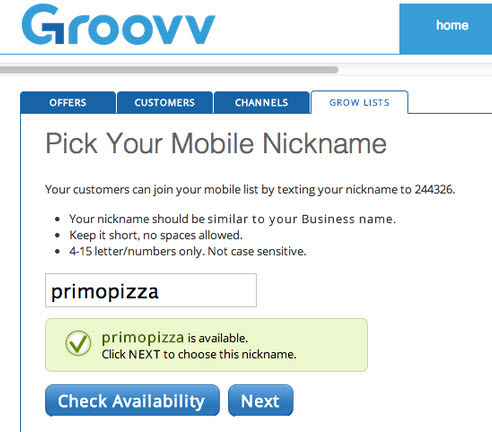 For example, if you’re a pizzeria and you chose “pizza” as your nickname, fans would text the keyword pizza to 244326. Once they join, they get automatically added to your Mobile Customers list, and receive your Welcome Message and Offer as an auto-reply text message after confirming they wish to opt into your list. 1. 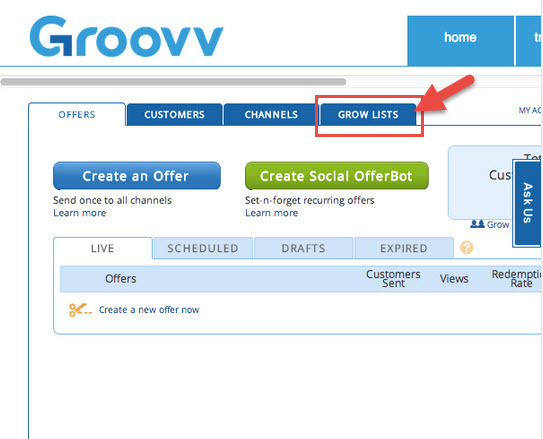 Click the Grow Lists tab from the Groovv Offers home screen. 2. 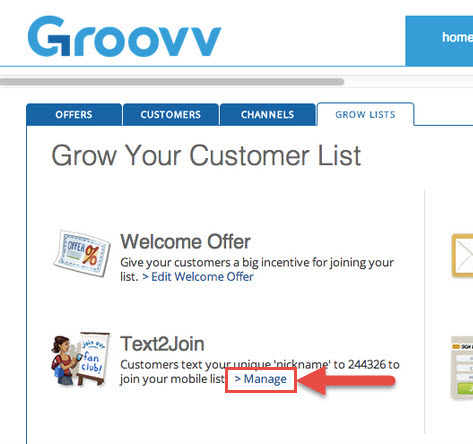 From the Grow Lists tab, click the > Manage link next to Text2Join. 3. Think of a nickname. It should be relatively short (between 4 and 15 characters), similar to your business name or industry, with no spaces. 4. Enter your desired nickname and click on Check Availabilty. If available, click Next to claim your nickname. If it’s not available, enter a different nickname and try again until you find an available keyword. Next, let’s create your Text2Join Welcome Offer. After your customers Text2Join your Mobile Nickname and confirm they wish to opt into your list, they will receive your Welcome Offer. 5. First, choose a Discount in either a percentage or amount off. Remember, the more valuable your discount, the more customers will join your mobile list and the more repeat sales you’ll make. So go Big! As in, “what’s the most you can give away” to compensate your customer for providing you with their most valuable asset – their attention. 6. 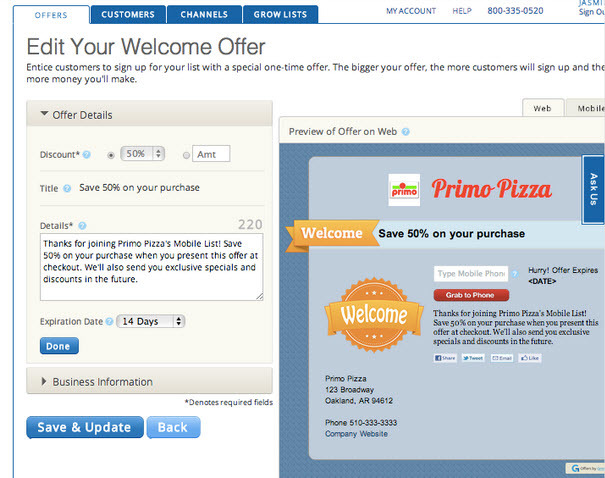 Customize your Welcome Offer’s Details and choose an Expiration Date. There is a default Details script, but now is the chance to personalize your message. 7. Add your Business Information. 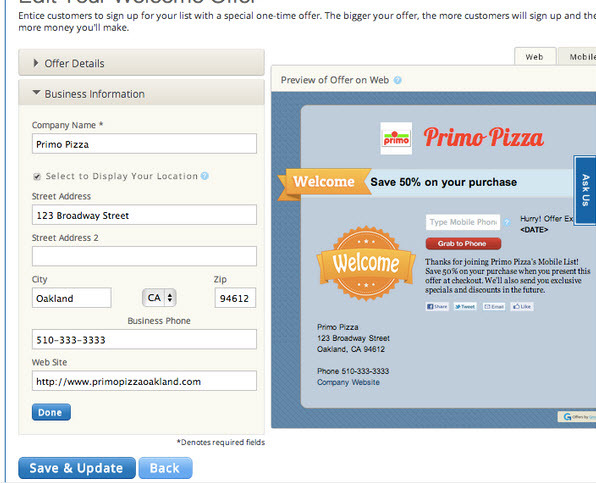 This will include your physical address, phone number, and (if you have one) your website on every welcome offer. When done, click the Save & Update button to finish. 8. 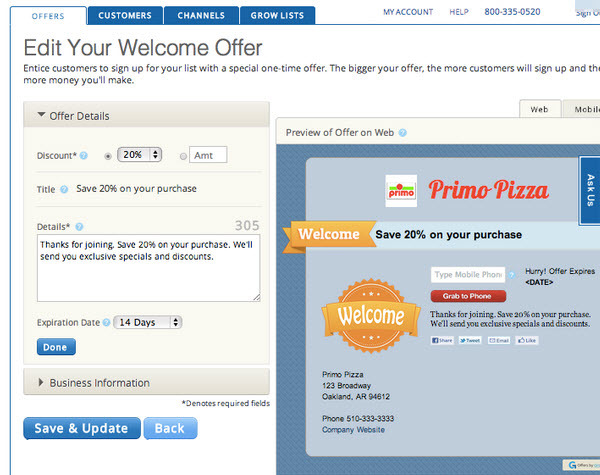 You will be returned to the Offers home screen, where your Welcome Offer will appear under your regular offers on the “Live” tab. You can View, Edit, or check the Stats of your Welcome Offer any time by clicking the corresponding links underneath the title. 9. Pretend you’re a customer and test Text2Join by texting your new Nickname to 244326 and following the resulting steps. If you’re having trouble, check the Text2Join troubleshooting guide here. Next: Already have a Customer List? Link to Facebook or Import your Email list. Then, create your first Offer!